The 9-band height gives the 30-minute height and direction for each swell component. Long, gradual swells are on the left, short steep chop is on the right. Tap or hover over a bar to see the exact height and direction of the wave period band. A single peak on the left half of the graph indicates a clean, strong swell. These longer period waves are more powerful and translate to higher surf. Broad or multiple peaks, usually on the right side of the graph, are generated nearby and may indicate bumpier, more confused seas. The last bar on the right measures short-period wind waves and chop (6-2 second periods). Wave heights in open water may reach the height indicated, but surf heights for wave periods this short are much lower and are usually not surfable. Visit this site often? Consider supporting us with a $10 contribution. This is a record of the buoy’s motion over the last 2 hours. Use the bar below the graph to scroll through time or zoom in and out. Wave sets (groups of larger waves) are the higher spikes on the graph. Use these spikes to see how often the sets are coming in and how many waves are in the sets. Checkboxes below the graph allow you to filter the waves by vertical height and horizontal north/south and east/west movement. This is helpful in determining wave heights when swell is coming from multiple directions. This graph shows the direction and period of the wave energy. Energy closer to the center of the circle is longer-period and results in larger breaking waves. A small bright point on the graph indicates a clean, focused swell. Broad areas of blue are disorganized wind waves and chop. 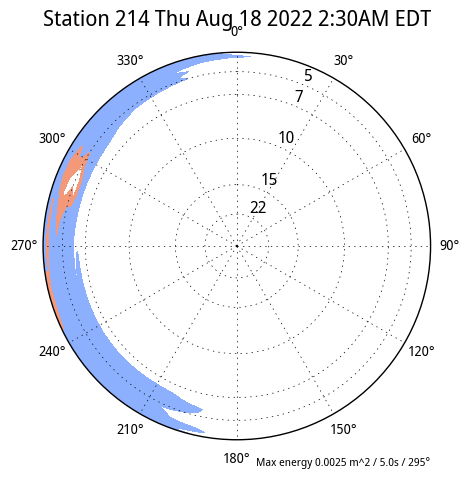 Real-time wind for select coastal stations are shown. The direction is in degrees: 360 equals wind from North, 90 equals wind from east, etc. Check out the waves on the St. Petersburg buoy!